Consider supporting the Red Devils with a purchase! These items (and more!) are planned to be for sale at the 90th anniversary celebration. Please consider supporting the 90th Anniversary and the Coffee Mess fund though your purchases! 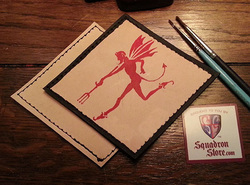 - Featuring the earliest known representation of the world famous Red Devil. 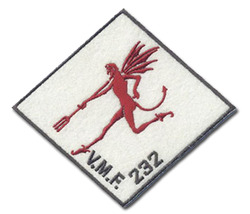 - The earliest known representation of the Red Devil and "VMF 232" are embroidered onto this felt-backed patch for an authentic vintage feel. 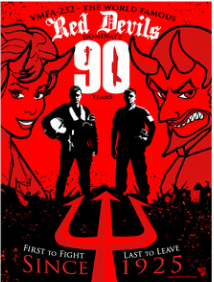 - This custom screen-printed poster features a pilot and maintainer standing on a pile of wrecked military machinery and flags of foes the Red Devils have vanquished over the last 90 years. The men are flanked by the Red Devil and "Hellena". 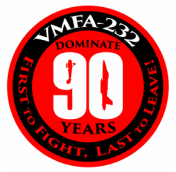 The 90th Anniversary logo appears above them and squadron motto below. 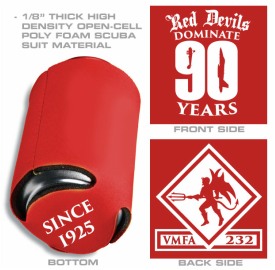 - Featuring the various emblems of the Red Devils on the back and the 90th Anniversary logo on the front.